Riding in Atlanta. Photo: Steve Eberhardt. On Friday, we published our first post about a subject we’ve rarely tackled here on the Green Lane Project blog: the links between biking and race in the United States. It’s the first in an ongoing series over the next three months that’ll finish with a report about ways that marginalized Americans are pushing for protected bike lanes and other quality infrastructure. In our first post, we looked at the fact that African-Americans use bikes at a slightly lower rate than other Americans even though African-American householders are twice as likely to live without a car. We asked “Why don’t more African-Americans ride bicycles?“, and as we hoped we’ve seen many thoughtful replies so far. Here are a few. I’ve boldfaced some of the writers’ key points. Every single day, I continue to see are hundreds of people of color(s) on bikes bumping along on sidewalks or hugging curbs of hostile arterials. Yet, absolutely nothing is done for bikes in those areas where they’re often most needed. For example, there’s not even so much as a ‘sharrow’ in a lot of LA south of I-10. The “MyFiguerora” project stops right by USC and the enhancements on MLK aren’t even worth talking about in the context of connecting the community further than again, USC. The same trend is repeated in other cities all throughout SoCal and is a pattern I’m sure any community activist in other parts of the country can relate to as well: black/brown communities lack bike accommodations. Then there’s the issue of the metric being used. The fallacy of measuring bike demand/usage solely by ‘commute trips‘ rears its ugly head highest when we’re discussing the segment of the population that has higher unemployment than the population at large. As it is, people are more apt to jump on their bike for a ride to a shop maybe 2 miles away than to ride 10 to get to work. (Yes, I’m aware that of plenty people actually do ride farther than that, myself being one of them on occasion.) Yet, measuring only commutes, especially given the aforementioned biases, continues to result in in the conclusion that there’s no reason to build anything. What I don’t want to see are these results turned into justification of a bunch of excuses to continue to do nothing of value in these communities. Of the 6Es of biking, ‘engineering’ is by far the most crucial in getting people to do it. The need for ‘encouragement’ and ‘education’ are a distant second and third place and many in the black community are well acquainted with ‘enforcement’ already. As agencies across the country finally take a closer look at biking, people need to keep a close eye on the plans to ensure that communities of color get the same high-quality infrastructure as everywhere else. That will provide for the hundreds of people already pedaling along as well as attract more to join them. I’m African American and Filipina. I live in Washington, D.C.’s Ward 7, 1 of 2 wards located East of the Anacostia. I moved here because I could still buy a home reasonably within the city limits. … I would say that I bike to work 3-4 times a week. That’s a total of 14-16 miles a day. My route illustrates why African Americans don’t. As you move west from my home towards downtown dc, you see that in the eastern part of the route it’s more treacherous and unsafe. There are fewer bike lanes SE than NW. And for the ones that we do have, the trails run through open air drug markets such as Marvin Gaye park. Regular cleaning campaigns by neighborhood volunteers help to keep broken glass off these trails. Also the painted bike lanes are not as clear and protected as they are on 12, 14, and 15th Streets NW. NW DC residents get clearly painted lanes and green ones. Some of their lanes have standing plastic posts to further mark off the lanes. We get a painted bike on the ground on Burroughs avenue and signs that direct us to move to the sidewalks once you get on and off the Whitney bridge. The bridges don’t have safe, clear routes for people to go south although they’re working on that in Ward 8 for the PA avenue bridge and to connect Anacosita with the Navy Yard. We also have concerns about crime. In my personal experience, it’s been fine. I leave out as early as 7:30 and settle in along the Anacostia River before I trek down by the Capitol. The ride says a lot about this city’s priorites on its residents and biking. I often ask friends and neighbors to join me in biking and they complain about the safety of biking in car crazy D.C., the concerns about street harassment, and many of the reason that you cite in your article . But in my experience, a big barrier is the lack of infrastructure. As a bicycle advocate working in America’s largest black city — the heart of American Black bike culture — there’s no lack of enthusiasm for cycling. I not only cycle, but I also swim, and run and am an Ironman triathlete so anything that you say we don’t do, insert your stereotype here, I guess I’ve done. Excuse my tone but I found your article interesting to say the least. I feel like one of those people who vote in every election but never get called by Gallup? It always kind of steams me when I see these articles that perpetuate the pathology that blacks do not exercise. They age old offensive declarations of the “poor black” person who can’t afford to do insert whatever the white oh so got it together person gets to do. When we well know that lack of physical activity has less to do with race and more to do with access but whatever. If you really want to get a sense of blacks and cycling you should reach out beyond your desk and talk to the thousands of black cyclists who belong to hundreds of black cycling groups all over the world. It might behoove you connect with many of the Major Taylor cycling clubs including the one I belong to called Major Taylor Cycling Club of Chicago. 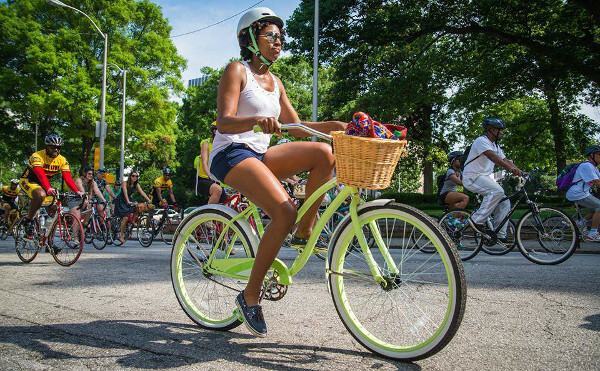 www.blackgirlsdobike.com is a movement to encourage more women of color to embrace cycling for recreation, sport, and transportation. Chapters are popping up in cities nationwide. Check it out! Keep those thoughts coming, and stay tuned for more exploration of these issues coming soon.